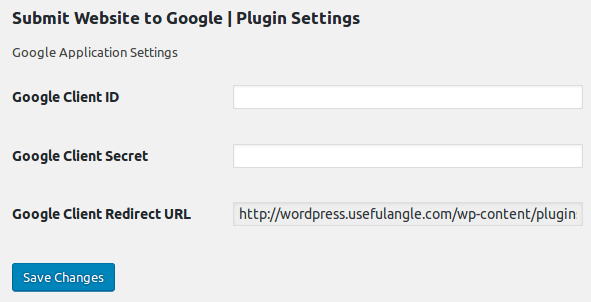 Through this plugin, users visiting your Wordpress website can submit their website and sitemap to Google. Traditionally website and sitemap submission is done through Google Webmasters Tools. But with this plugin, you can allow public users to do so from your own Wordpress website. After you add a shortcode to a Wordpress page or post, visitors can submit their website in 3 steps. In the first step the user enters the url of his website. The user is authenticated with Google, and then the website is submitted to Google Webmasters. Google requires that the website is verified prior to submitting the sitemap. 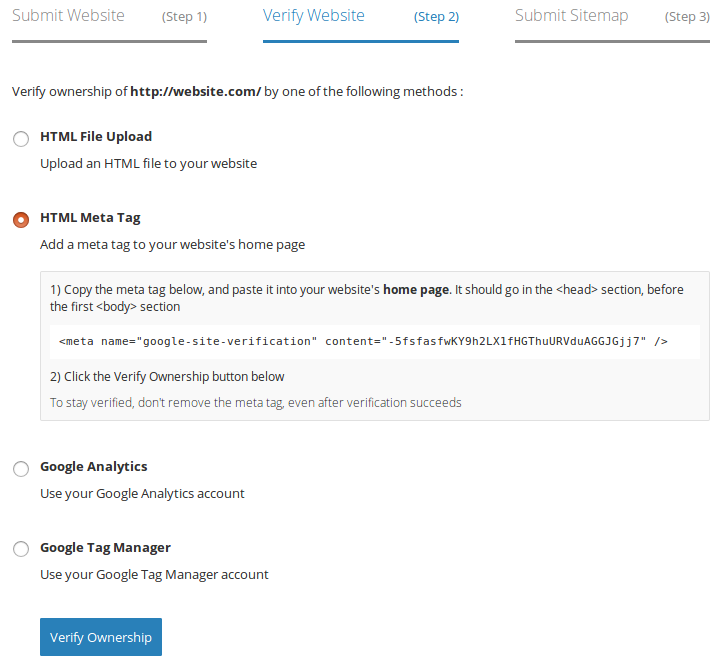 Users are shown 4 options to verfy the website – Placing a HTML file, Adding a meta tag, Using Google Analytics and Using Google Tag Manager. The plugin generates the required verification files and meta tags. In the third step, the user can submit his sitemap to Google. The start of SEO is obviously Google. Everyone wants their new website to be seen on Google. To be seen on Google it is very important to submit the website and sitemap to Google. Through this Wordpress, visitors can do this from your website itself. This can make your website look good and useful to vistors. Especially when you have a SEO related website, you can use this plugin to guide your visitors to submit their new website to Google. Plugin uses Google Site Verification and Google Search Console APIs to submit website and sitemap. All the files – PHP, CSS, JS & HTML are well commented. Necessary security features been added to the code, like verifying AJAX requests for XSS vulneribilities. The official Google SDK has not been used. The official SDK is huge (in MBs) and complicated. Instead required API calls have been implemented, and the total size of the API class is just 7Kb. All HTML elements in the code are suffixed so as to prevent conflict with other plugin. Plugin comes with a thorough documentation on how to install and use.